Modern boardgames come with all kinds of different themes that allow you to take on roles ranging from the mundane to the fantastic. I personally love games that come in a sci fi or fantasy flavor; one classic sci fi/fantasy theme that has not been well portrayed on the tabletop is that of time travel. Those days are behind us now with Temporum, the latest game from Donald X. Vaccarino, the designer of Dominion! In Temporum you take on the role of time traveler and are trying to advance your influence throughout time so that eventually you have the greatest influence in the time period when time travel is invented so that you will rule the future! Temporum has the feel of a Donald X Vaccarino game–the board consists several time periods, each with multiple options of realities and each of these realities is randomly dealt out before the game begins (or you can use different sets of realities recommended in the rulebook). 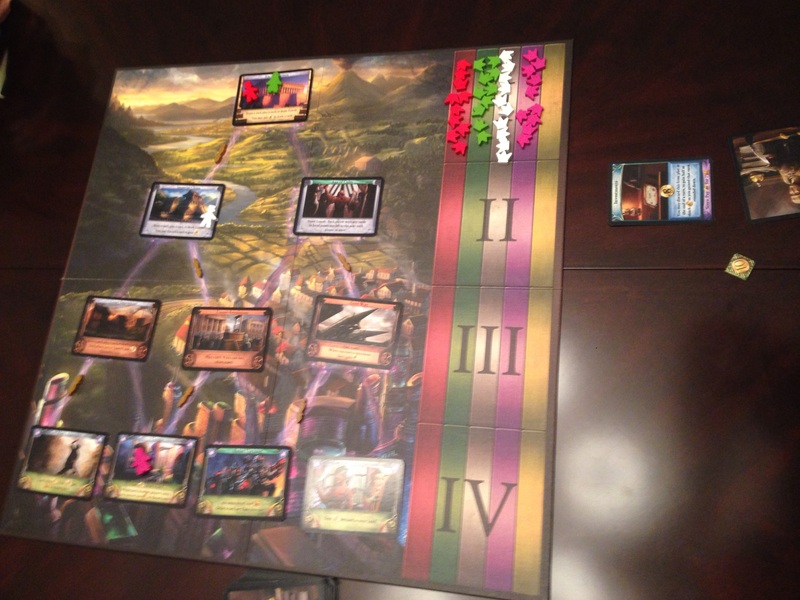 In another similarity to Dominion, the player turn is quite simple in what you do–first you may change the flow of time to the era immediately following the one you are in, then you may travel to any time period along the time line which is currently real, the card for the reality you choose to visit that turn is resolved, and then you check to see if victory has been attained. Most of the action takes place when you are resolving the card for the reality you are visiting, but the actions that may be taken are very limited–depending on what the card is, you generally may only draw cards from the action deck, play cards from you hand, or score cards from your hand. Certain realities have other special effects, but drawing, playing, or scoring cards are the core of what you do. When you play a card, you gain the amount of gold printed on it and resolve its effect. Cards with gold backgrounds are one time use cards and are discarded after use; cards with blue backgrounds are permanent cards and give the player various special effects in ongoing turns. If you look at the bottom of each of the cards, you will see that they each have a purple section at the bottom of them. This is because each card can also be scored instead of played. 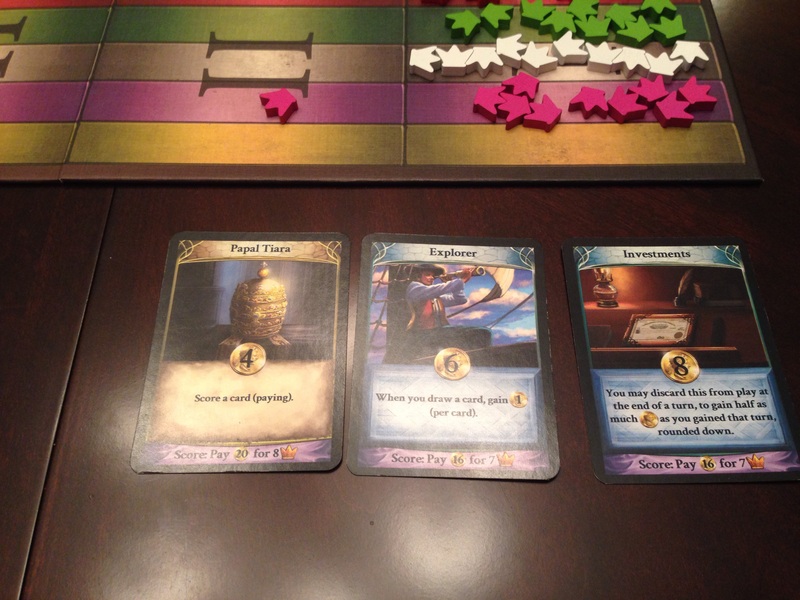 When a player scores a card, they pay an amount of gold listed in the purple area of the card and advance the number of their crown tokens along the scoring track. A card that has been played made not be scored and a card that has been scored may not be played; this causes the conundrum of which cards to play and which cards to score as the cards that tend to allow a player to advance the most crowns when scored tend to also have some of the most powerful effects when they are played instead. The crown tokens denote a player’s level of influence in each time period and the player with the most in each zone is said to rule that time period; ruling a time period can give different benefits depending on which and how many time periods you rule in when you resolve the effects of certain reality cards. Once a player has advanced all of their crown tokens to the last time zone, they win the game! Temporum comes to us from the publisher of Dominion, Rio Grande Games. This game comes with the high quality components I have come to expect from Rio Grande Games. The game board and cards are well printed and beautifully illustrated. Temporum also uses high quality wooden player and crown tokens; as a bonus, your little player meeple are awesome steampunk meeple! 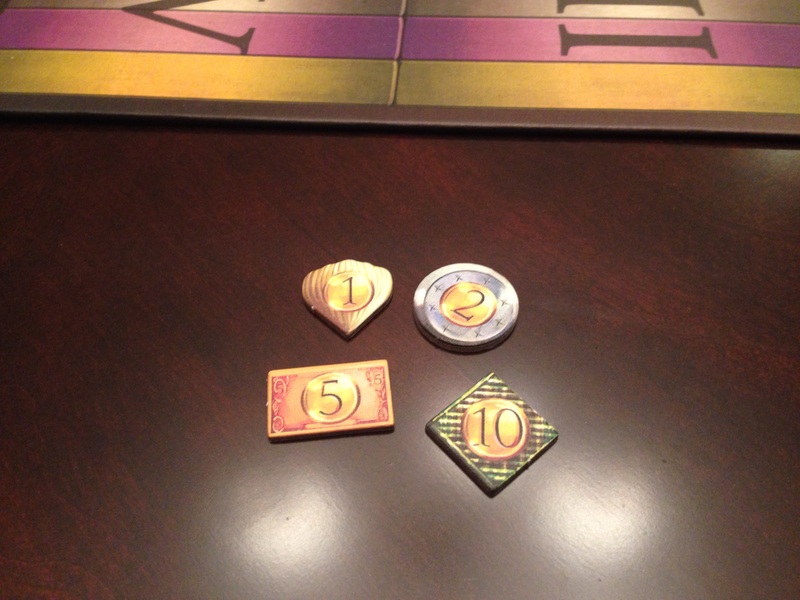 The gold tokens are made from quality cardboard and are shaped like various currencies throughout time. My friends insist the shells used as the most primitive of currencies looks like a clove of garlic. The use of different currencies from different times makes for a nice nod to the time travel theme. Due to all of the timey-wimey silliness that can potentially happen with a time travel game, this is one genre that hasn’t really been touched all that much on the tabetop. Temporum is really the first time travel themed game I have played which successfully captures the feel of classic time travel tropes. The earlier you travel back in time, the fewer options there are of realities; when you shift the time line below you, it moves the flow of time to completely different alternate realities and moves the other players in those time periods into the new reality. The card options for each reality range from things that actually happened in history (e.g. Ancient Greece, the Great Depression, the Cold War, etc.) to fun and fanciful realities different from our own (e.g. the Holy Norse Empire, Egyptian America, the Balloon Revolution, etc.). Cards for the time period which denotes the future from where we are in time now range from dystopian post-apocalyptic worlds to various Utopias to the Age of Cats. The cards which are played or scored also have names based off of common time travel tropes–you can stomp on a butterfly to change all of time or you can make wise investments in the past based off of your knowledge of the future. As I have said before, if you have ever played Dominion you can tell that this game was designed by the same game designer. The basic mechanics of the game are very simple to master, the complexity of the game comes in determining the various combos and synergies you can find between the different time zones and cards you play. With the wide selection of options or realities for each time period, no game ends up being the same. 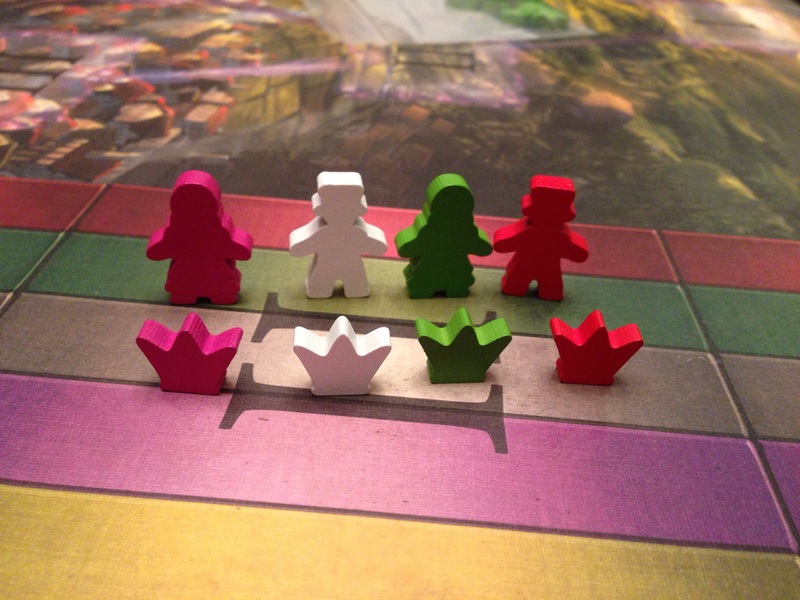 Player turns go very quickly at the beginning of the game and gradually start to take longer as players gain more gold, cards, and abilities from their permanent cards. The game length can vary depending on what reality cards are available, but once my gaming group had gotten the hang of the mechanics games lasted about 30 minutes. I was lucky enough to play the only prototype copy of this game at Gen Con last year and I was dying to pick up a copy for myself (it took a while for it to actually hit the market). After playing this game quite a bit more I have found that it definitely has great replay value; similar to Dominion, Temporum is a game with simple core mechanics that are then shaped into a different play experience based on which cards are in use for that gaming session. Any time we play a game of Temporum, we always end up playing at least two or three times with different realities each time. Temporum is one of those games that is quick to learn but difficult to master. Players must weigh whether they want to play a great card to give them immediate or ongoing benefits or if they want to score that card and get closer to winning the game; sure you might have a crazy combo built up that gives you tons of different benefits whenever you do something, but if you don’t score some of those awesome cards eventually you’re never going to win. This game also feels like it could easily have expansions slipped into it much in the way expansions work for Dominion; on Board Game Geek Donald X. Vaccarino has stated that he has written an expansion for Temporum and it is up to Rio Grande Games if it will be published or not. I really hope they do. 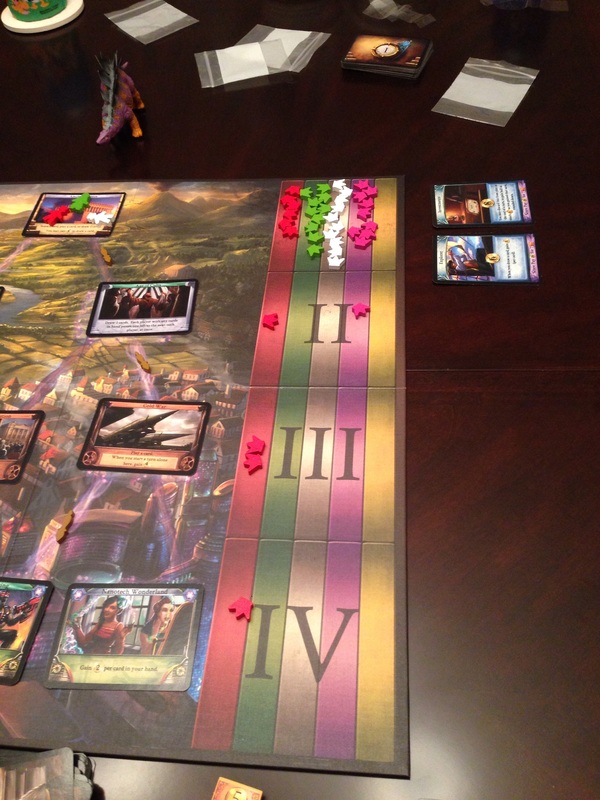 Temporum has quickly become one of my favorite games to break out at game night. It can accommodate from two to five players and manages to be one of the rare games that plays well with any number of players. I give Temporum 4.5 out of 5 stars.